A new method allows the quantum state of atomic “qubits”—the basic unit of information in quantum computers—to be measured with twenty times less error than was previously possible, without losing any atoms. Accurately measuring qubit states, which are analogous to the one or zero states of bits in traditional computing, is a vital step in the development of quantum computers. A paper describing the method by researchers at Penn State appears March 25, 2019 in the journal Nature Physics. To measure qubit states, the team first uses lasers to cool and trap about 160 atoms in a three-dimensional lattice with X, Y, and Z axes. Initially, the lasers trap all of the atoms identically, regardless of their quantum state. The researchers then rotate the polarization of one of the laser beams that creates the X lattice, which spatially shifts atoms in one qubit state to the left and atoms in the other qubit state to the right. If an atom starts in a superposition of the two qubit states, it ends up in a superposition of having moved to the left and having moved to the right. They then switch to an X lattice with a smaller lattice spacing, which tightly traps the atoms in their new superposition of shifted positions. When light is then scattered from each atom to observe where it is, each atom is either found shifted left or shifted right, with a probability that depends on its initial state. The measurement of each atom’s position is equivalent to a measurement of each atom’s initial qubit state. The team determined the accuracy of their new method by loading their lattices with atoms in either one or the other qubit states and performing the measurement. They were able to accurately measure atom states with a fidelity of 0.9994, meaning that there were only six errors in 10,000 measurements, a twenty-fold improvement on previous methods. Additionally, the error rate was not impacted by the number of qubits that the team measured in each experiment and because there was no loss of atoms, the atoms could be reused in a quantum computer to perform the next calculation. 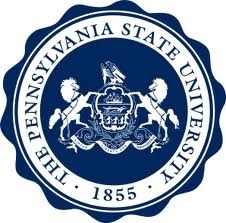 In addition to Weiss, the research team at Penn State includes Tsung-Yao Wu, Aishwarya Kumar, and Felipe Giraldo. The research was supported by the U.S. National Science Foundation. An international team of researchers combined observations of nearby supernova SN1987A, made with NASA’s Chandra X-Ray Observatory, with simulations to measure the temperature atoms in the shock wave that occurs from the explosive death of a star. This image superimposes synthetic X-ray emission data onto a density map with from the simulation of SN1987A. Credit: Marco Miceli, Dipartimento di Fisica e Chimica, Università di Palermo, and INAF-Osservatorio Astronomico di Palermo, Palermo, Italy. A new method to measure the temperature of atoms during the explosive death of a star will help scientists understand the shock wave that occurs as a result of this supernova explosion. An international team of researchers, including a Penn State scientist, combined observations of a nearby supernova remnant—the structure remaining after a star’s explosion—with simulations in order to measure the temperature of slow-moving gas atoms surrounding the star as they are heated by the material propelled outward by the blast. The research team analyzed long-term observations of the nearby supernova remnant SN1987A using NASA’s Chandra X-ray Observatory and created a model describing the supernova. The team confirmed that the temperature of even the heaviest atoms—which had not yet been investigated—is related to their atomic weight, answering a long-standing question about shock waves and providing important information about their physical processes. A paper describing the results appears January 21, 2019, in the journal Nature Astronomy. The supernova shock front, the abrupt transition between the supersonic explosion and the gas surrounding the exploding star, is similar to transition in a “hydraulic jump,” where a high-speed stream of water hitting a surface flows smoothly outwards and then abruptly jumps in height and becomes turbulent. Credit: James Kilfiger, Wikimedia Commons. SN1987a fromNASA/ESA Hubble Space Telescope in Jan. 2017 using its Wide Field Camera 3 (WFC3). It is also the first to be studied in detail with modern astronomical instruments. The light from its explosion first reached earth on February 23, 1987, and since then it has been observed at all wavelengths of light, from radio waves to X-rays and gamma waves. The research team used these observations to build a model describing the supernova. In 2016, an international team of scientists found definitive evidence — tiny ripples in space known as gravitational waves — to support one of the last remaining untested predictions of Einstein’s theory of general relativity. The team used the Laser Interferometer Gravitational-Wave Observatory (LIGO), which has since made several gravitational wave discoveries. 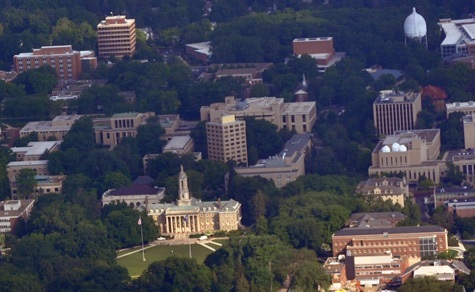 Each discovery was possible in part because of a global network of supercomputer clusters, one of which is housed at Penn State. Researchers use this network, known as the LIGO Data Grid, to analyze the gravitational wave data. Penn State recently invested in an upgrade to its portion of the data grid that will roughly quadruple the cluster’s capacity for conducting cutting-edge astronomy and astrophysics research. The new cluster, 192 servers working in tandem, is administered by the Institute for CyberScience (ICS). Bangalore Sathyaprakash, professor of astronomy and astrophysics and Elsbach Professor of Physics; and Chad Hanna, associate professor of physics and astronomy and astrophysics, and ICS co-hired faculty member, are the primary researchers who will be using the new system with their research team and collaborators. The new cluster will vastly increase the speed at which researchers can complete analysis, according to Chad Hanna. He and colleagues recently finished the first study that used data housed on Penn State’s LIGO cluster. The team designed an experiment to quantify the number of binary black holes in the universe that have less mass than the Sun, which may have implications for the amount of dark matter in the universe. The upgrade boosts the cluster from 1,152 compute cores to 4,608 cores, which will allow more researchers to use the system simultaneously. For reference, this is roughly equivalent to more than 1,000 desktop computers working in unison. Researchers at all levels will be using the new resource, including undergraduate students like Phoebe McClincy, a sophomore studying astronomy and astrophysics, and a Millennium Scholar. McClincy was first exposed to gravitational wave research as a high school student attending a Penn State summer camp led by Hanna. The first iteration of LIGO’s observatories collected data from 2002 to 2010 but did not detect any gravitational waves. Upgrading the observatories to their current state, known as Advanced LIGO, greatly increased their detection capabilities, and, as a result, the system has detected six gravitational wave events since 2016. Sathyaprakash said there are plans to continue enhancing the detection capabilities of gravitational wave observatories, which will pose both opportunities and challenges for researchers. “When advanced LIGO reaches its design sensitivity, we will observe binary black hole collisions as far as tens of billions of light years and binary neutron star mergers billions of light years away. With the construction in the 2030s of new detectors that are 10 times more sensitive than the current ones, we will be able to observe the entire universe in gravitational waves for black holes and most of the universe for neutron stars,” he said. Coming with that will be challenges in collecting, storing and analyzing huge amounts of data. It has taken between one and three months to analyze each gravitational wave detected to date. An unusual infrared emission detected by the Hubble Space Telescope from a nearby neutron star could indicate that the pulsar has features never before seen. The observation, by a team of researchers at Penn State, Sabanci University in Turkey, and the University of Arizona, could help astronomers better understand the evolution of neutron stars — the incredibly dense remnants of massive stars after a supernova. A paper describing the research and two possible explanations for the unusual finding appears Sept. 17 in The Astrophysical Journal. Animated llustrated GIF showing a neutron star with a circum-pulsar disk. 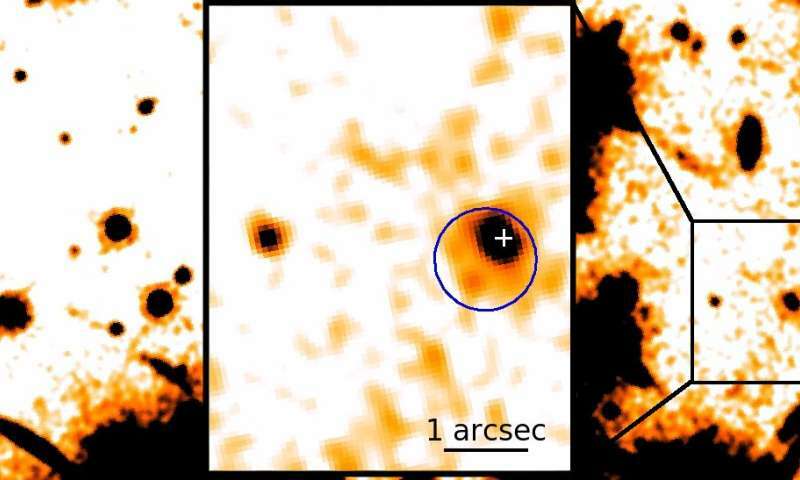 If seen at the proper angle the scattered emission from the inner part of the disk could produce the extended infrared emission observed by astronomers around the neutron star RX J0806.4-4123. A paper describing the research appears January 4, 2018 in the journal Nature along with a paper from a separate group from Germany that shows that a similar mechanism can be used to make a gas of ultracold atoms exhibit four-dimensional quantum Hall physics as well. This quantization of conductance, first described in two-dimensions, cannot be observed in an ordinary three-dimensional material, but in 2000, it was shown theoretically that a similar quantization could be observed in four spatial dimensions. To model this four-dimensional space, the researchers built waveguide arrays. Each waveguide is essentially a tube, which behaves like a wire for light. This “tube” is inscribed through high-quality glass using a powerful laser. Many of these waveguides are inscribed closely spaced through a single piece of glass to form the array. The researchers used a recently-developed technique to encode “synthetic dimensions” into the positions of the waveguides. In other words, the complex patterns of the waveguide positions act as a manifestation of the higher-dimensional coordinates. By encoding two extra synthetic dimensions into the complex geometric structure of the waveguides, the researchers were able to model the two-dimensional system as having a total of four spatial dimensions. The researchers then measured how light flowed through the device and found that it behaved precisely according to the predictions of the four-dimensional quantum Hall effect. In addition to Rechtsman, the research team includes Jonathan Guglielmon at Penn State; Oded Zilberberg at ETH Zurich; Sheng Huang, Mohan Wang, and Kevin Chen at the University of Pittsburgh; and Yaacov E. Kraus at the Holon Institute of Technology. The research was supported by the U.S. National Science Foundation, the Charles E. Kaufman Foundation, the Alfred P. Sloan Foundation, and the Swiss National Science Foundation. The researchers used Hubble’s Wide Field Camera 3 [WFC3] to conduct spectroscopic observations of the exoplanet’s atmosphere in near-infrared light. Hubble made the observations as the distant world traveled behind its star, an event called a secondary eclipse. This type of eclipse yields information on the temperature of the constituents in the atmosphere of the exoplanet’s dayside. The team’s results appeared in The Astronomical Journal.